I had an unusually quiet morning at home with my three year old son Noah today. After a bit of a crazy weekend we decided to hang out at home, play a bit of football and bake a cake. 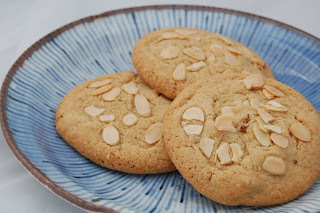 Unfortunately we couldn’t agree on a cake (I wanted to try the Hummingbird honey and walnut loaf, but apparently Noah doesn’t like nuts), so we went with the apricot and almond cookies from the same book (he didn’t realise almonds were nuts). It’s a very straightforward recipe with plenty for Noah to do. 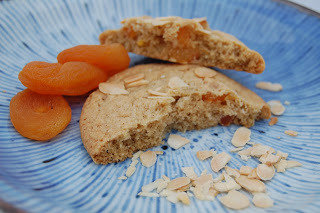 He soon tired of chopping apricots, but thought pressing toasted almonds into balls of cookie dough was fun. The cookies came out well, though finding exactly the right cooking time for a good mix of chewiness and crunch was a bit tricky. I think we decided that 18 minutes gave the best results in the end. 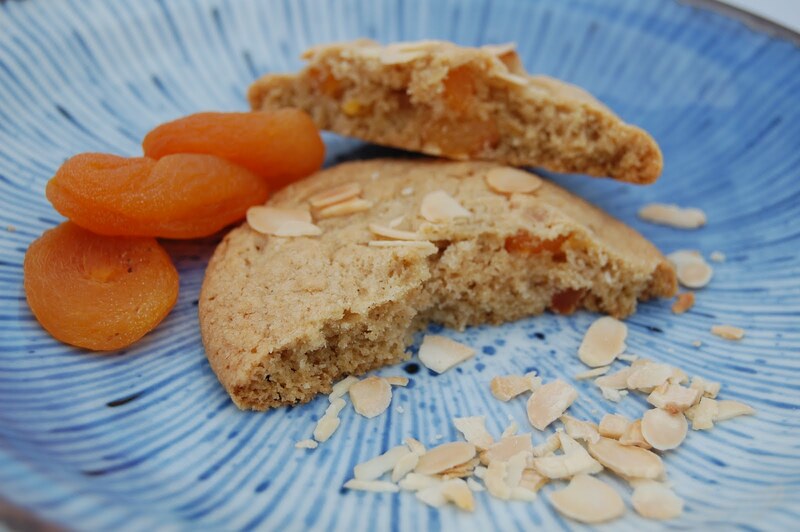 The flavour combination was good, with neither the apricots or the almonds being too overwhelming. Noah loved them and has decided that whilst walnuts are still ‘yuck’ and we’re never going to make the honey and walnut loaf, almonds are his new favourite thing, even if they are actually nuts. Preheat the oven to 170 degrees centigrade and line three baking sheets with parchment. Cream together the butter and both sugars until light and fluffy. Add the egg, then the vanilla essence. Sift together the flour, salt, cinnamon and bicarbonate of soda. Add to the butter and sugar mixture in two batches, then stir in the apricots and ground almonds. Shape the cookie dough into approxiamtely 12 balls, using about 2 tablespoons for each one. Place the balls on the baking trays, leaving large gaps between each. I only cooked four on each tray. Press flaked almonds into the top of each ball and cook for 15-20 minutes until golden brown. Leave to cool on the tray for ten minutes before transferring to a cooling rack. 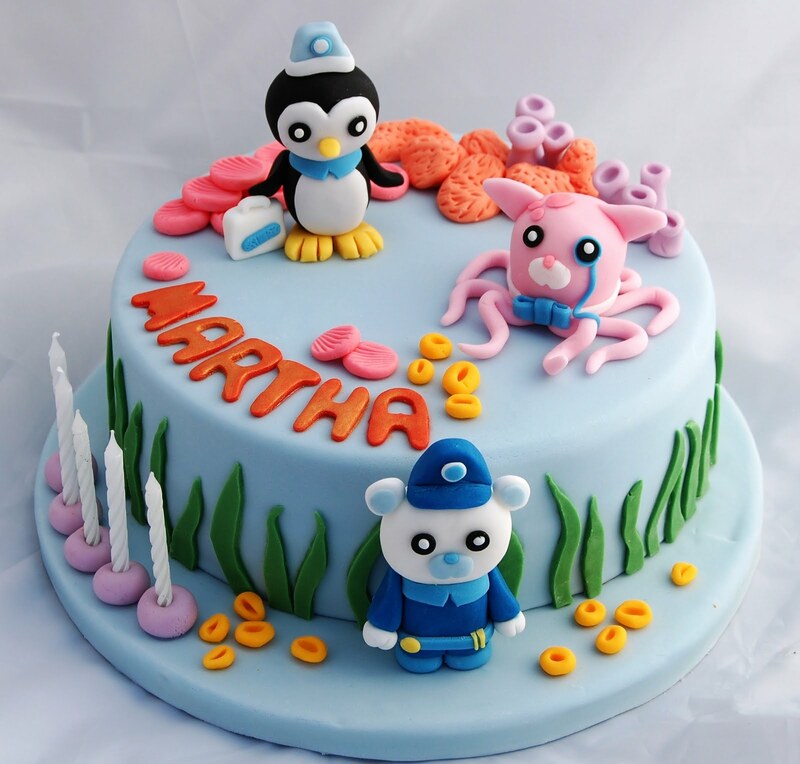 I know I’ve already posted a picture of an Octonauts cake, but I made a slightly different one this weekend and because I’m quite proud of it I’m going to post this one too. My theory has always been that making a cake for the second time would be much quicker than the first attempt because I would already have the design worked out and wouldn’t need any ‘thinking time’. I was still up until 1.30am for this one, but I’d like to think that if it hadn’t been for the Thai curry and prosecco breaks it would indeed have been a reasonably early finish. Still, it was nice to have company while I worked. Thanks for staying up late with me Cath, and happy birthday Martha. love this!! GReat job on the cake!! I have a Noah too 🙂 He'll be 3 this spring, and we are trying to plan an Octonauts birthday for him. Thanks for sharing!